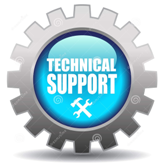 Copar offers 24 hour support for all of its products. We have free support during regular working hours Monday thru Friday 7am to 5pm central time and paid support for after hours of 5pm to 7am and weekends. Copar also has the black box data recorder on all our CSSC 7 and CSSC 8 systems. Our engineers view your corrugator real time and find out what happened and where during the time of the problem. Copar can replay you problems live as if they were watching your machine run. Copar also has a maintenance contract that plants can purchase for preventative maintenance to make sure that your Copar system will function at 100% all of the time. The contract will be for two visits per year and each visit the Field Service Engineer will spend two weekdays a total of 16 hours in plant at your location for this PM. Copar offers several training opportunities from our Copar training staff for your plant needs. Copar also has a process control specialist that is willing to travel to your site and train your corrugator supervisor, crew and any other personnel that need process training for a thorough understanding of the Copar process control system and how your plant benefits from the Copar system. Please contact our service department for scheduling opportunities.